What air is to the body, prayer is to the soul, which is why, as Ed Hays tells, Jesus instructed us to pray ceaselessly. 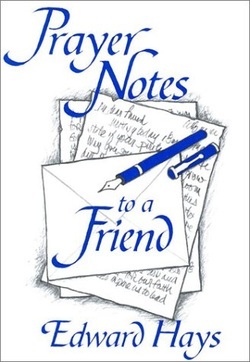 The author of the bestselling prayers for the Domestic Church and Prayers for a Planetary Pilgrim now lets us look over his shoulder as he writes his "dear friends" personal notes filled with powerful insights about how to enhance and renew our daily prayer life. Drawing on over forty years of experience as a spiritual director and "soul companion," Hays offers reflections on such provocative topics as "oven prayer," "jugular prayer," "chutzpah prayer," the original rosary, and the "prayer of the eye." that deepen and enrich our devotional life and everyday activities."